Book Online to enjoy Special Rates! Please make your reservation AT LEAST 72 hours before your departure so we have time to get your confirmation to you before you leave. Please give 72 hours notice of cancellation to avoid being charged. Kindly complete the below form. E-mail address is compulsory*. Please check your e-mail address is correct before submitting your online booking. 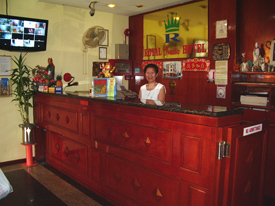 Early check-in is subjected to room availability and charges. Late check-out will incur charge.